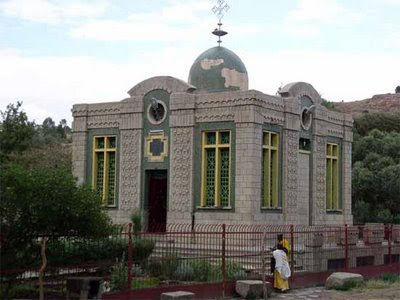 Abuna Pauolos, patriarch of the Orthodox Church of Ethiopia, has announced that tomorrow will finally see the revealing of the biblical Ark of the Covenant, which his church is said to have guarded for centuries. According to those who adhere to the legend, King Solomon and the Queen of Sheba had a son named Menelik I, who eventually came to Jerusalem as a young man and spirited the real Ark of the Covenant away (with Solomon's blessing). The patriarch has said that a museum is being built in Ethiopia where the Ark will be displayed for all to see. If it is the real Ark of the Covenant, let us hope that these guys know what they are doing, and have read the instruction manual (namely the Old Testament) really meticulously. UPDATE 06/26/2009 9:20 p.m. EST: As many have noted, the announced time of today's "revealing" of the Ark of the Covenant has more than come and gone, with nothing to show for it. There are some allegations coming out of Ethiopia that Abuna Pauolos has a shady background. Here's WorldNetDaily's report on the failure of the patriarch to produce the goods. This should really be interesting to see, I have heard of the Ark of the Covenant, since I was a child. I hope it will be televised. I have been trawling the net and still have no new news regarding this event, can any one point me to the right site?? It was supposed to have been at 8 a.m. EST this morning our time... but so far there has been nothing. is the original Episcopal throne of Alexandria, mentioned in the Acts of Peter the Patriarch, Origen, Clement and other sources and dated to the first century. I read the book. I loved it but I want to know what everyone else thinks? I think its very important but I am not an expert. His blog with additional information is http://www.stephanhuller.blogspot.com. Maybe you can tell me if this for real. I believe that the “ark of the covenant” (Heb.9:4) and “the ark of his (God’s) testament” (Re.11:9) are one in the same, and contain the “tables of the covenant” (Heb.9:4), the Ten Commandments. I believe that the ark of the covenant/the ark of his testament is now in the temple of God in heaven (Re.11:19). At the Seventh TRUMPET (1 Thess.4:16-17), the temple of God is opened in heaven to reveal the ark of His testament (Re.11:19). And, again, at the GIVING of the Seven Last PLAGUES (Re.15:1-8), “the temple of the tabernacle of the testimony in heaven was opened” (Re.15:5), wherein is contained “the ark of his testament” (Re.11:19), “the ark of the covenant” (Heb.9:4). ALLAH THE ALMIGHTY IS ALREADY ON EARTH!!!!! Please refer to someone incharged fitted whatever doctrine you are. This is an exceptionally distinguished essence fitted all mankind.